Nintendo Drops The Big One! The unveiling of The Legend of Zelda: Spirit Tracks at this past week's Game Developers Conference was a nice surprise, though not totally out of left field. However, Nintendo is truly capitalizing on their company's policy of only revealing games shortly before they're ready to release - this time taking it to the extreme. In a private conference with Nintendo execs, we learned about another new Zelda title in the works - actually ready to ship (in stores by April 5th to coincide with the launch of the new DSi hardware) - but this one will be coming to the home console, Wii. 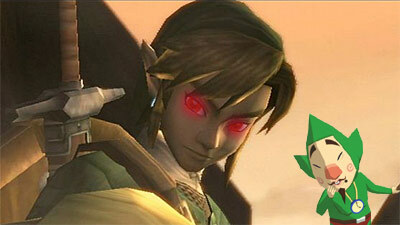 The official title is The Legend of Zelda: Night of Gloom, and it will feature a return of Link's latest sidekick, Midna. Nintendo has yet to reveal too many specifics about the game, but we do know that Link will play a more sinister role this time around, as he has been overtaken by darkness (see The Legend of Zelda: Twilight Princess). Night of Gloom will feature many of the same motion features and Wii-specific functionality of Twilight Princess, though we're told the controls have been tightened up and new gameplay elements will bring both the story and overall experience into completely new territory for the series. We were only shown a short trailer, with just a few gameplay snippets weaved in, but what we saw knocked our socks off. Unlike Twilight Princess, Night of Gloom looks to be taking full advantage of every ounce of processing juice the Wii can muster. This also marks the very first Zelda game to feature full-on orchestral arrangements, composed and conducted by none other than Koji Kondo. Of special interest, perhaps, is the return of Tingle, another of Link's famous (infamous) collaborators throughout the series. We're told that Zelda turns to the little, green fairy for help in warding off Link, who, this time around, acts as the game's main antagonist. There's even a hint at romance between Tingle and the princess, though Nintendo evaded our questions when asked directly about the matter. As for the actual gameplay, we know there will be a heavy focus on multiplayer and mini-games. There seem to be some obvious cues being taken from the Mario party series, and we did catch a glimpse of Link, Ganondorf, and other related characters partaking in a chicken-throwing competition. Wii Speak was being used during this mini-game, with players blowing into the microphone to puff up the feathers of their chickens before making a tossing gesture with the Wii Remote. Night of Gloom follows the story and art direction of Twilight Princess, and it's looking like Nintendo will be opting to keep toon Link on the handheld for the time being - on Wii, adult Link is here to stay! Nintendo has assured us that the same trailer we viewed will release on the Nintendo Channel and television worldwide shortly before the big release of the actual game (and DSi). It's been a while since they've gotten us this stirred up, but boy, when Nintendo apologizes to their fans (last year's E3 anyone? ), they really go for broke! Keep it here for more as we near the game's release on April 5th.